So, its down to the wire and I am finishing up my last minute swaps. I went to Innisfail yesterday to take part in a stamping get together, hosted by Robin, a friend from Innisfail. She has been putting on these getogethers for at least six months before Peggy and I did our big Edmonton Extravaganza in May this year. It was pretty amazing- there is so much raw talent there and I learned so much from just the one day. Wish I could have gone today as well- but I have so much to do before I go. Anyways, without much ado, here are some of the cards I've made. My rolling monkey card is one of my personal favourites. 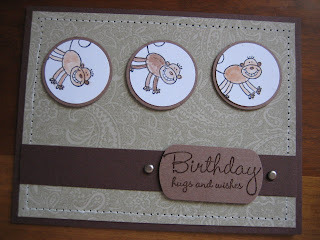 The monkey is from "Zoofari", one of the new Stampin'Up! sets. I coloured them with reinkers and my Aquapainter. The background is Paisley Bkg stamped in River rock ink on sahara sand paper. the sentiment is embossed. I like the stitching but I am not font of piercing so I don't see myself repeating this for a lot of the swaps. 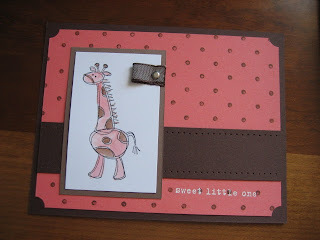 This cute giraffe is from the Bundles of Joy set. I coloured her in with reinkers and the aquapainter (can you say Diane discovers watercolour painting with the aquapainter?). The paper is groovy guava- I've recently discovered how much I really like this colour. It is one of the new "in" colours- ie they will only sell this colour for one year, then they retire it. 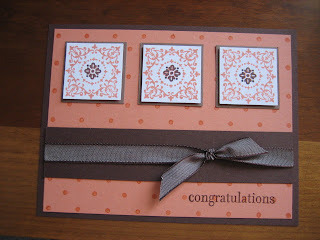 The background stamp is a polka dot bkg, also a new set from Stampin' Up!. The brown is chocolate chip paper. The next card is using the same groovy guava. I love this new combination! 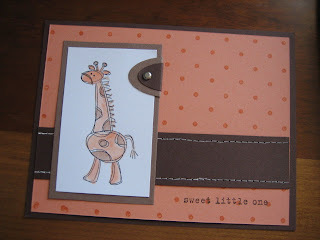 !The stamp is from a card kit called " Simple Delights". It has some lovely and classic stamps but I've had a hard time coming up with designs using this kit. I broke out the new chocolate chip taffeta ribbon with this card. The taffeta ribbon is growing on me. I am going to miss the narrow choc chip grosgrain ribbon they retired. Instead, they have a wider choc chip ribbon, which I hear is the same colour as the old stuff. I had a look at the rest of the taffeta ribbon- they are very, very nice, especially the green ribbon. Finally, I also have the giraffe, making a reprise in cameo coral colour. The sentiment is embossed . I used white pigment ink and white embossing powder to get good coverage on the words. Posted by Diane aka cameldiva at 7:17 p.m.
Hey Diane, I like the cards for convention. Good luck down there with all the trading. Have fun! July 23, 2007 at 11:16 p.m.